The Riverwise Writing Workshop is arming a new generation of storytellers with the tools to shape their own stories. 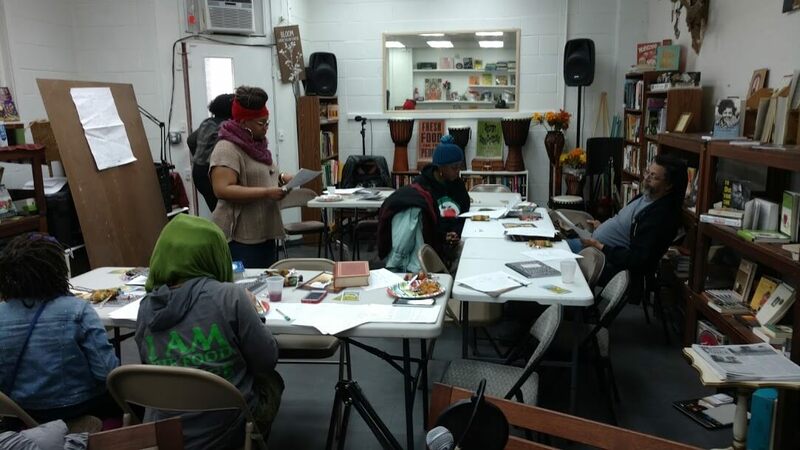 Local activists deeply-rooted in their communities are developing skills writing poetry and prose and learning photography to chronicle their experiences. Led by a team of experienced writers and photographers, Riverwise is developing written and visual storytelling skills. The poetry series, facilitated by Riverwise Collective member and author Tawanna Petty, was held at two locations: the KAN Co-op Bookstore in North End, where owner Jamii Tata has developed literacy programming and provides space for young people to do spoken word. An additional workshop was held at the James and Grace Lee Boggs Center for Nurturing Community Leadership in Island View facilitated by Khalid El Hakim, who runs the Black History 101 Mobile Museum. Several of the historical artifacts from the mobile museum were used as a starting point in the writing exercise. Following the poetry workshops, Riverwise will host a storytelling through prose program in June. The workshop will be conducted at Detroit Sip, a new coffee shop and gathering place west of the Six Mile/Livernois District. In July, a summer workshop focused on photography, “IT Happened”, kicks off at the Baltimore Gallery, east of the New Center district. The workshop will be run by Tiarra Overstreet-Amos of Moon Reflections Photography. The training is helping grassroots community members to tell their stories from their own point of view. Riverwise is working with other groups supported by the Detroit Journalism Engagement Fund to get some of the work published on other local news outlets’ sites. Campbell believes the workshops, which have been inter-generational, can help people become more engaged in what’s happening in their neighborhoods and can help spread the word about what’s needed to strengthen the region.